The giraffe (Giraffa) is a genus of African even-toed ungulate mammals, the tallest living terrestrial animals and the largest ruminants. The genus consists of eleven species including Giraffa camelopardalis, the type species. Seven of these species are extinct, prehistoric species known from fossils, while four are still extant. Whereas Giraffa once was thought to contain a single extant species with numerous subspecies, research into the mitochondrial and nuclear DNA of Giraffa has revealed four to six distinct extant species. The four-species taxonomic classification has the genus Giraffa composed of the species Giraffa giraffa (southern giraffe), Giraffa tippelskirchi (Masai giraffe), Giraffa reticulata (reticulated giraffe) and Giraffa camelopardalis (northern giraffe). The giraffe’s chief distinguishing characteristics are its extremely long neck and legs, its horn-like ossicones, and its distinctive coat patterns. It is classified under the family Giraffidae, along with its closest extant relative, the okapi. Each of the four species is distinguished by its coat patterns and genetics. Its scattered range extends from Chad in the north to South Africa in the south, and from Niger in the west to Somalia in the east. Giraffes usually inhabit savannahs and woodlands. 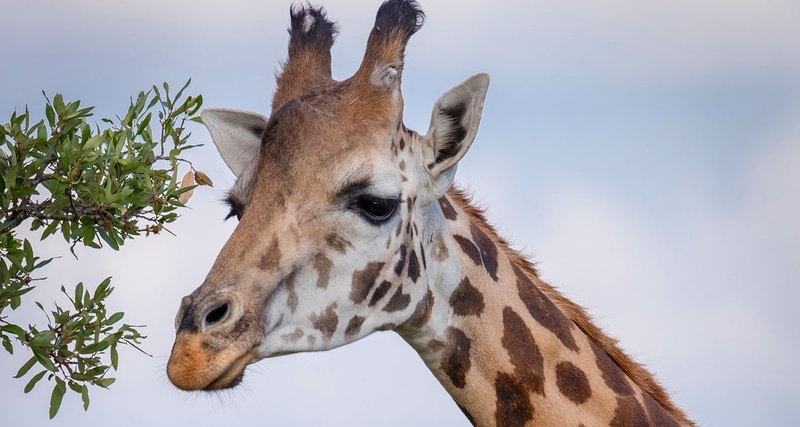 Their food source is leaves, fruits and flowers of woody plants, primarily acacia species, which they browse at heights most other herbivores cannot reach. Giraffes may be preyed on by lions, leopards, spotted hyenas and African wild dogs. Giraffes live in herds of related females and their offspring, or bachelor herds of unrelated adult males, but are gregarious and may gather in large aggregations. Males establish social hierarchies through “necking”, which are combat bouts where the neck is used as a weapon. Dominant males gain mating access to females, which bear the sole responsibility for raising the young. The giraffe has intrigued various cultures, both ancient and modern, for its peculiar appearance, and has often been featured in paintings, books, and cartoons. It is classified by the International Union for Conservation of Nature as Vulnerable to extinction, and has been extirpated from many parts of its former range. Giraffes are still found in numerous national parks and game reserves but estimations as of 2016 indicate that there are approximately 97,500 members of Giraffa in the wild, with around 1,144 in captivity. In late 2016 a study found the giraffe population had plummeted from about 157,000 to 97,500 in the last 30 years and the species had jumped two IUCN categories from “least concern” to now “vulnerable”. As the human population in Africa rises, habitat loss from farming and deforestation, illegal hunting and the impact of civil wars are all pushing the creature towards extinction. “Whilst giraffes are commonly seen on safari, in the media and in zoos, people – including conservationists – are unaware that these majestic animals are undergoing a silent extinction,” said Julian Fennessy, co-chair of the IUCN’s giraffe and okapi specialist group. “It is timely that we stick our neck out for the giraffe before it is too late,” he said.